Faites de l’équitation, de la tyrolienne, de la descente en rappel en cascade et du VTT pour cette excursion guidée toute la journée dans la jungle de Jaco. Montez sur un cheval du Costa Rica et passez devant des arbres géants, des singes et des aras nicheurs. 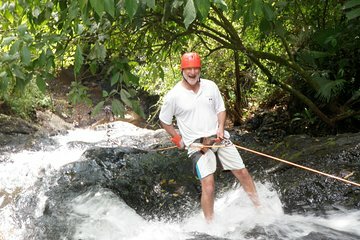 Ensuite, apprenez à faire une descente en rappel dans une chute d’eau avant de faire une tyrolienne dans le cadre de la forêt tropicale. Terminez la journée avec une excursion en VTT l’après-midi. Un déjeuner Costaricain est également inclus. This Full Day Jaco Adventure was a perfect one day get away for our entire family. It was an excellent value for the memorable experience. The staff and the owner are just really good people and we would definitely return to do it again. If you do one thing in Jaco, do this tour! The experience is so exciting and well planned. Our tour guide was amazing and so knowledgeable about the local plants and each of the activities. You get a good amount of time to do each activity and hotel pickup is very convenient. The lunch provided was delicious and the view is great. This is a must do. We enjoyed all activities very much and the guides Lomar, Jose and Lucy greatly enhanced all of the activities. Highly recommend. L staff were amazing!! They funny and friendly... Offered encouragement when needed with do!e of the adventures. My group and I had a great time and made lasting memories. This is THE tour. Full day tour is highly recommended!! We had a great group of people. Lunch was great! Our instructors were funny, great, and knowledgeable. Unforgettable experience!! We had the best time on our tour! The guides made it extra fun and memorable. Upon arrival we were greeted by the friendly staff and immediately started our tour. The horses were easy to ride with beautiful scenic views along the way. Water rappelling was challenging but beforehand the instructors took the time to explain what we had to do. Zip lining was also amazing! 7 lines above and between the trees, followed by ATV's. Our guide Lmar, also known as Pan Dulce, took the time to stop along our trail and educate us on Ants, Mango trees and other insects. It was unexpected but a lot of fun! They gave us a delicious lunch and kept our bags safe. Overall, we all agreed that if we are ever back in Costa Rica we would definitely do the tour again! Thanks again for an amazing experience! This was an amazing trip. It was a full day of fun and adventure. The guides were wonderful and knowledgeable about the local area. Jose, our head guide was entertaining as well as encouraging. We rode horses, repelled down a waterfall, ziplined through the jungle and rode ATV's. Lunch was delicious. Both my husband and myself 100 recommend this tour. Go! Have fun! Pura Vida!